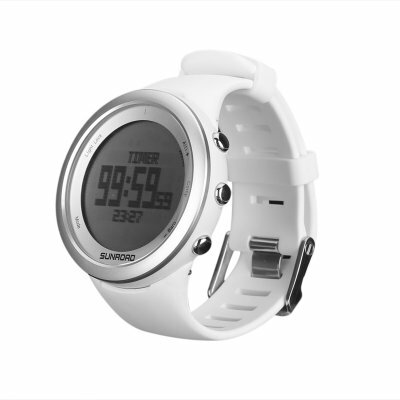 Successfully Added Sunroad FR852A Outdoor Sports Watch - LCD Display, Weatherproof, Calorie Counter, Compass, Altitude, Barometer, Stopwatch to your Shopping Cart. Together with the Sunroad FR852A sports watch, you will be able to work towards a healthier future filled with sports and exercise. With its sleek and stylish design, this smart health accessory can be confidently worn on any occasion by both men and women. As any high-end sports watch out there, the Sunroad FR852A comes packed with an abundance of smart health features – truly supporting you on your road to meet your future fitness goals. When not used for one of its plenty sports features, this outdoor gadget can additionally be used as a regular clock. Displaying the dime, date, sunrise and sunset times, and the weather – it will constantly keep you up to date. Coming with a backlight feature, this outdoor gadget can be used efficiently both at day and night. Its abundance of features are not only limited to health and fitness, but also include numerous other outdoor tools such as a compass, altitude, temperature, and pressure meter. When used for its health features, this sports watch will keep you constantly up to date on the number of calories that you’ve burned throughout your workout, your pace, the covered range, and even the difference of altitude levels throughout your workout. With all this data at hand, you’ll be able to efficiently adjust your upcoming workouts to meet your fitness demands – guaranteeing the fastest possible health results. Its weatherproof design lets you use this stylish outdoor gadget in any weather condition. Whether it’s sunny, raining, or snowing – nothing will stop you from heading out into the wild. Further increasing your overall user experience is the watch’s countdown and stopwatch feature – providing you with even more useful tools that are sure to come in handy while exercising. With its powerful battery, this sports watch will take you through years without running out of juice unexpectedly. The latter is, however, not something to worry about as this outdoor gadget features a battery change reminder – ensuring that you’ll always be notified when it’s time to replace your current battery. The Sunroad FR852A sports watch comes with a 12 months warranty, brought to you by the leader in electronic devices as well as wholesale electronic gadgets..
Arabic: - يشاهد في الهواء الطلق - Chinese Simplified: - 户外手表 - Czech: - Outdoorové hodinky - Danish: - Udendørs ur - Dutch: - Outdoor horloge - French: - Montre Outdoor - German: - Outdoor-Uhr - Hebrew: - Watch חיצונית - Hindi: - आउटडोर देखो - Italian: - Orologio all'aperto - Japanese: - 屋外時計 - Korean: - 옥외 시계 - Malay: - Watch Kolam - Norwegian Bokmål: - Outdoorklokke - Romanian: - Uita-te in aer liber - Russian: - Открытый часы - Spanish: - Reloj al aire libre - Thai: - นาฬิกากลางแจ้ง - Turkish: - Açık izle - Vietnamese: - Hồ xem.